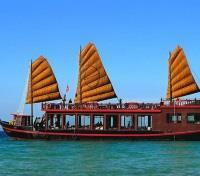 Sail through exclusive, less-visited inlets of Halong Bay on an all-inclusive cruise with butler service. 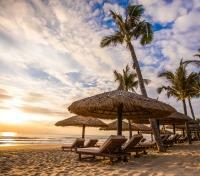 Pamper your body & soul at a five-star resort in Nha Trang. 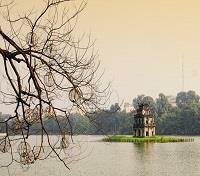 Discover the treasures of historic Ho Chi Minh City and Hanoi with a private guide. Specially curated opulent luxury accommodations throughout. Discover the grandeur of historic Ho Chi Minh City and Hanoi with a private guide & driver while staying at elegant five-star hotels. 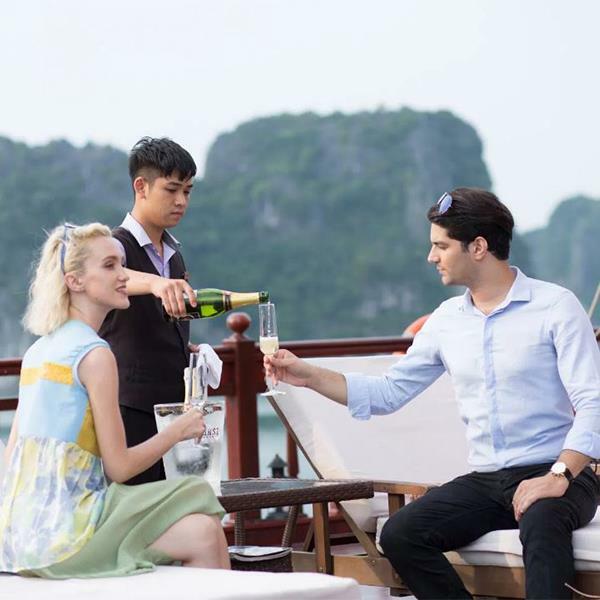 Sail around majestic Halong Bay on a luxury overnight cruise with butler service, and pamper your body and soul at an idyllic breach resort in Nha Trang. This prestigious tour brings Vietnam's finest experiences to life. Enjoy VIP fast-track service including your Vietnam visa upon arrival in Ho Chi Minh City, and take a private guided tour of the moving War Remnants Museum and awe-inspiring Notre Dame Cathedral. A private car will take you to the Mekong Delta where you'll visit an authentic floating market, visit magnificent bonsai gardens and take a VIP Mekong boat cruise amid spectacular scenery. Escape to the tropics in Nha Trang, where mountains on three sides shelter the bay and provide a dramatic backdrop for a luxurious beach retreat. Discover the ancient culture, colonial architecture, broad tree-lined boulevards, and beautiful lakes of Hanoi with your private guide. Set sail in Bai Tu Long Bay, an exclusive and less visited region of Halong Bay, where 3,000 limestone karsts jut forth from emerald waters. Explore magnificent caves and beaches, and pamper yourself with included spa and butler services. Discover Vietnam in posh style on this elegantly crafted itinerary that features an elegant spin on the cities, the scenery and the sands of this dazzling corner of Southeast Asia. Welcome to Vietnam! Please note: Your travel documents contain a Visa-on-Arrival letter (unless otherwise arranged). Please ensure to pack this in your carry-on luggage. Your Visa-on-Arrival letter must be presented to Customs upon entry into the country. Upon your arrival at the airport, you will be welcomed by a hostess holding a sign with your name on it who will help you through the fast tracked process to get your visa stamped. Once you obtain a stamp for your visa and have collected your luggage, your hostess will happily take you to your waiting guide and vehicle. You will be privately transferred between your accommodations and Ho Chi Minh Airport by a professional driver and an English-speaking guide. 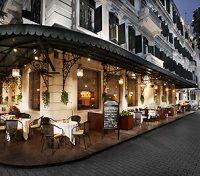 The Reverie Saigon is a luxury hotel in Ho Chi Minh City, with a prime location on the Nguyen Hue Boulevard. Renowned for its beautiful interior designs, the Reverie Saigon also raises the bar for services and accommodations in Vietnam. Crafted to perfection, guestrooms are magnificently furnished and their large windows feature wonderful city or river views. The hotel is home to five of Saigon’s most exemplary restaurants and bars, each representing the epitome of what the region has to offer culinary enthusiasts. The Royal Pavilion captures the essence of Cantonese fine dining, and R&J Italian /Lounge & Restaurant and the Long @ Times Square, offer delicious traditional Italian cuisine. Dine at Café Cardinal anytime of the day for French cuisine with a twist, and visit the Deli for freshly made lighter fare options. Guests have access to the hotel’s spa and recreation center, which offers and extensive range of pampering treatments, outdoor swimming pools, and a fitness center. The history of Ho Chi Minh City has many layers, weaving a tale of decades of external Chinese, French and American influence. This morning, meet with your driver and English-speaking guide at your hotel and begin your day with a moving visit to the War Remnants Museum, intended as a call for peace with the hopes that the horrors of that war will never be repeated. 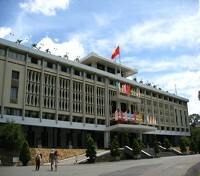 The museum features a comprehensive collection of the machinery, weapons, and photos of the Vietnamese side of the war, and includes a moving tribute to the journalists, civilians, and soldiers lost during the war, as well as a critical look at biological warfare, weaponry, and worldwide movements for peace. Continue to the Reunification Palace, also known as the Independence Palace, which was the former residence of the President of South Vietnam until the end of April 1975 during the Fall of Saigon. It was here that the Vietnam War ended when a North Vietnamese Army tank crashed through its gates and led to the formal reunification of the two sides. Continue by car to the Ben Thanh Market, a great place to shop for souvenirs, and bustling with midday activity. Pause for lunch nearby at a local restaurant. In the afternoon, visit the Notre Dame Cathedral, where the French colonial presence can be felt. The neo-romanesque Catholic Basilica was constructed from 1877 to 1833 entirely of imported French building material, including bricks from Marseilles and stained-glass windows from Chartres. Head across the street to the Saigon Central Post Office, a stunning architectural marvel with rich Gothic, Renaissance and French influences. Head over by car to Cholon, the city’s Chinatown, and widely regarded as the largest one in the world by area. 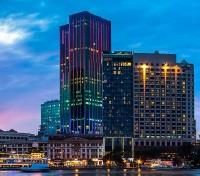 The city used to be known as Saigon-Cholon until Vietnam’s independence from France in 1955. From here continue to the Jade Emperor Pagoda, also known as Phuoc Hai and regarded as one of the most interesting pagodas in the country. Built by the Cantonese community around the turn of the 20th century and it is still busy with worshipers. Filled with smoky incense, the pagoda with its elaborately carved figurines and decorated panels of carved gilt woodwork, is dedicated to Buddhist and Taoist deities. If you only visit one pagoda in the city, this should be the one. The mighty Mekong River is the lifeblood of Vietnam and its neighbors. Originating high up in the Tibetan plateau in China, it winds across Southeast Asia for over 2700 miles and reaches its Delta on the outskirts of Ho Chi Minh City. 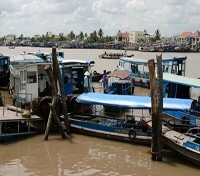 The Mekong Delta is a veritable biological treasure trove of unique species found nowhere else, the area is also integral to agricultural production in southern Vietnam. This morning, head into the country side for 62 miles to Cai Be on a scenic journey with your private driver and English-speaking guide. Here you’ll hop in a long-tailed boat to cruise around the floating market, where you’ll find villagers exchanging goods and produce from their canoes. The Catholic cathedral in the background of the floating market makes for a dramatic photo opportunity. Head to the opposite side of the Mekong River to Hoa Binh Phuoc islet, a fascinating maze of shady creeks that are best explored from the comfort of your boat. Stop for a typical Vietnamese lunch at a small local restaurant. After lunch, mingle with the local people and visit a bonsai garden, where you can learn a few tips on caring for these delicate miniature trees. Visit the local rural homes of the region, where families still produce traditional tiles and ceramics and check out the home industries at a rice paper kiln and coconut candy kiln. At the end of the day, settle in for the two-hour transfer back to the city. Board a flight from Ho Chi Minh City with direct service to Nha Trang. Approximate flight time is one hour and five minutes. You will be privately transferred between your accommodations and Nha Trang Airport by a professional driver and an English-speaking guide. The Anam’s concept is to deliver an experience of the bygone Indochine Era, which is reflected in its architecture, design and service standards. Combining this historical ambience with modern and luxurious facilities, the Anam is a haven of serenity and service. Down to the smallest details, guests will feel they have traveled back in time. No Shoes. No News. No Stress. 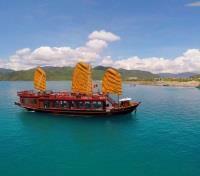 The resort is found along a stretch of beach on one of the world’s most beautiful bays, Nha Trang. 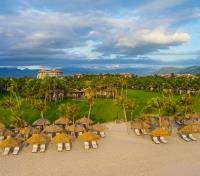 Guests can enjoy stunning views of the ocean and its islands to the east and rugged, jungle-clad mountains to the west. With warm tropical breezes, swaying palms, and the ocean at your doorstep, The Anam’s signature designed villas, nestled harmoniously into the surroundings, is as close to paradise as one can find. You will be picked up by private car and English speaking guide for a visit to Yang Bay Waterfall. Take photos along the way and enjoy the view of the green covered countryside and villages. Enjoy Yang Bay and Yang Khang Waterfalls. 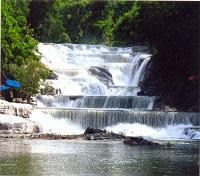 Spend a leisurely day swimming and resting in the hammocks by the falls. After lunch, experience a live musical show by Yang Bay artists. You will continue to visit an orchid garden and view a bear conservation area by electric car. Board a flight from Nha Trang with direct service to Hanoi. Approximate flight time is one hour and 50 minutes. You will be privately transferred between your accommodations and Hanoi Airport by a professional driver and an English-speaking guide. 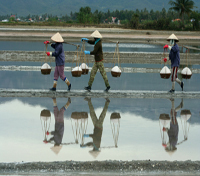 Water puppetry has a long and storied tradition in Vietnam, dating back to the 11th century. The puppets are made of lacquered wood, and the shows performed in a waist-deep pool, with an accompanying traditional Vietnamese orchestra. This evening, meet with your driver and English-speaking guide for a night out at the Thang Long Opera Theater for a traditional theatrical performance, followed by a delicious dinner at La Verticale, a restaurant specializing in French-Indochina cuisine. If La Verticale is extremely busy or not available, another restaurant of the same quality will be offered. 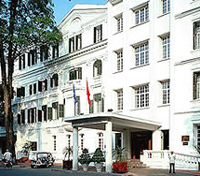 Located steps from the Opera House in Hanoi’s iconic French Quarter, the Sofitel Legend Metropole Hanoi welcomes guests with an air of colonial grandeur and timeless elegance. Originally crafted by French aristocrats in the early 1900’s, the property combines old-world charm and history with modern convenience and luxury. Offering 364 rooms and suites across two wings, guests can choose from the historical grandeur of the Metropole Wing or the neo-classical elegance of the Opera Wing. All rooms are equipped with Sofitel’s MyBed, in-room Wi Fi, safety deposit box and minibar. Well-appointed dining options range from Le Beaulieu, serving fine French cuisine, to Spices Garden for local Hanoi specialties. Tucked away in a private oasis on the grounds, the hotel’s stately swimming pool offers carefree relaxation in sophisticated surroundings adjacent to a fitness center equipped with state of the art equipment. Hanoi enjoys a rich Imperial history dating back over a millennium, and a surprising diversity of local ethnic groups weave the fabric of the city’s rich tapestry. Start your day on the outskirts of the city with your private driver and English-speaking guide by visiting the Museum of Ethnology. The museum provides an insightful glimpse into the country’s lengthy history, with more than 15,000 photos and 10,000 objects and artifacts depicting a historical perspective of the lives, activities, customs, and habits of the 54 recognized ethnic groups of Vietnam. Drive back into central Hanoi, stopping at the Temple of Literature, built in 1070 and dedicated to Confucius. Enjoy a local Vietnamese lunch at Banh Tom Ho Tay, a restaurant famous for its shrimp cakes in the West Lake area. After lunch, visit Truc Bach Lake, featuring a monument to the late US Senator John McCain, commemorating the spot where he parachuted to safety after his plane was shot down over the lakes. At the nearby Huu Tiep Lake, the wreckage of an American B-52 bomber lies as a memorial to the war. From here, visit Hoa Lo Prison, constructed in 1896 by the French to house Vietnamese political prisoners. Under the French regime, it was known as the Maison Centrale and was an important symbol of colonialist exploitation of the era. The Vietnamese took it over in 1954, and the prison was subsequently used to house prisoners of war from 1964 to 1973, where it came to be known sarcastically as the Hanoi Hilton by American POWs. It is bound to be a moving visit. Continue to Ngoc Son Temple, a pagoda situated on a small island in Hoan Kiem Lake accessible by a classically painted wooden bridge. The view of the city from the pagoda is particularly popular. End your day at a by walking through the iconic Old Quarter. The streets of this district are bustling with scooters, bicycles, cyclos, and cars zipping around pedestrians. The best way to enjoy the charming colonial architecture is to wander with your guide at a leisurely pace and be sure to stop for a cup of Vietnamese coffee or a local snack from one of the many tantalizing street vendors. Your guide and private driver will accompany you back to your hotel, or if you prefer to enjoy dinner at your pace in the Old Quarter and soak up the atmosphere, you can make your own way back to your hotel at your leisure. 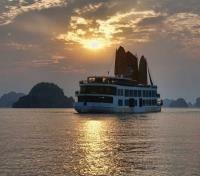 In the morning, transfer from Hanoi to Halong Bay. The transfer is approximately 4 hours. You may stop on the way to admire the local scenery. Welcome on board the Emperor Cruises! Check-in at Vinashin Dock, meet your Experience Manager who will assist you with boarding at the cruise and get ready to set sail towards Bai Tu Long Bay! Check-in to your cabin as you set sail to cruise among the many beautiful islets. Bai Tu Long Bay has a wild beauty and the panoramas from the boat are unforgettable. After lunch, visit Vung Vieng fishing village, the famous pearl-growing village, to view the fishing tanks of the local people. You will have time to observe the process of feeding pearl as well as learning a little about the life of the local people. Afterwards, proceed to Vung Vieng floating village to board bamboo boats so the locals can row you around their village and oyster pearl farming plots. Return to the boat by speedboat. The cruise continues from the Vung Vieng fishing village to Cong Do (sleeping area), where you will enjoy the wonderful beauty of Bai Tu Long Bay at sunset, admire the striking islands and islets, relax, indulge yourself and savor the peaceful atmosphere which can only be found out here among the islands. Later in the afternoon, choose from kayaking, just relaxing or taking afternoon tea and watching the sky color change as the sun sets. Prior to dinner, attend the chef’s cooking demonstration and try your skills in the art of traditional Vietnamese cooking (making spring rolls) in a truly stunning setting. This evening enjoy Movie Night, Board Games or Massage and Spa services or even go squid fishing. Indulge yourself with a once in a lifetime experience in Vietnam by embarking on Emperor Cruises and cruising around Bai Tu Long Bay, an alternative to the more touristy and crowded parts of Ha Long Bay. Venture off the beaten track, and visit floating fish farms and villages to experience the daily life of the locals. There is plenty of time for nature lovers to discover many secluded beaches, lagoons, coves and caves. Cruising, it is all about you and the experience. The staff will ensure that your cruising experience is comfortable and special, with excellent food, friendly staff, an interesting cruise itinerary with many activities on board, on the water and under water, service excellence, attention to detail, elegance, sophistication and, of course, safety guaranteed. Emperor Cruises’ fleet of vessels will combine classic elegance with modern comfort. The beautifully built, custom-designed, traditional imperial cruise ship features three decks that house a smart restaurant, bars, a small library, a massage room plus luxurious en-suite cabins with private balconies. Wake up to the gentle lapping of the water against the boat and as the first rays of the sun announce a new day. Before enjoying breakfast have cookies and tea and then try the tai chi session on the sundeck as the sun rises over Bai Tu Long Bay. After breakfast, explore the area of Hon Co Island and Co Cave (Grass Cave, also known as Thien Canh Son). You can revel in the breathtaking view of Bai Tu Long bay from up high, as well as the glorious long white-sand beach of Hon Co Island. Afterwards relax on the beach, go swimming in the crystal clear water and explore the cave. Afterwards, you will return to the cruise by speedboat. Later in the morning return to your boat where brunch will be served on board while the vessel cruises back to the harbour. 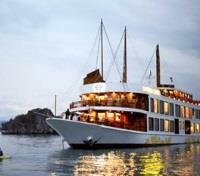 Upon arrival to the Emperor Cruises dock in Halong Bay, you'll disembark from your ship. Meet your professional driver for a transfer back to Hanoi.